Zimmerman & Jansen were Louis J. Zimmerman (1865-1944?) and Charles Jansen (1847-1937?). They were partners at 513-515 East 148th St., the Bronx, from 1895 to 1903. Louis J. Zimmerman was born in 1865 in Bavaria, Germany, and immigrated to the U. S. in the early 1870s. According to his naturalization petition dated 28 June 1886 he was born 10 June 1865 and arrived in the U. S. May 1872. He was recorded in the 1900 U. S. Census, age 34, with a slightly different birth date, October 1865. Charles Jansen was born in Denmark. According to his naturalization petition dated 28 Sept. 1887, he arrived in the U. S. Spring, 1876. He was recorded in the 1900 U. S. Census, age 52, born November 1847. He lived at that time on Van Cortlandt Ave., the Bronx, with his wife, Matilda, a native of Germany. Following his partnership with Charles Jansen, Louis J. Zimmerman continued in the iron foundry business at 513-515 East 148th St. until 1907. In 1907 he moved the business to 279-281 East 148th St., where he stayed in business through 1911. Following his partnership with Louis J. Zimmerman, Charles Jansen became a building contractor, an engineer and a machinist. He was 77 years old in the 1925 New York State Census, living at 325 East 163rd St., the Bronx. 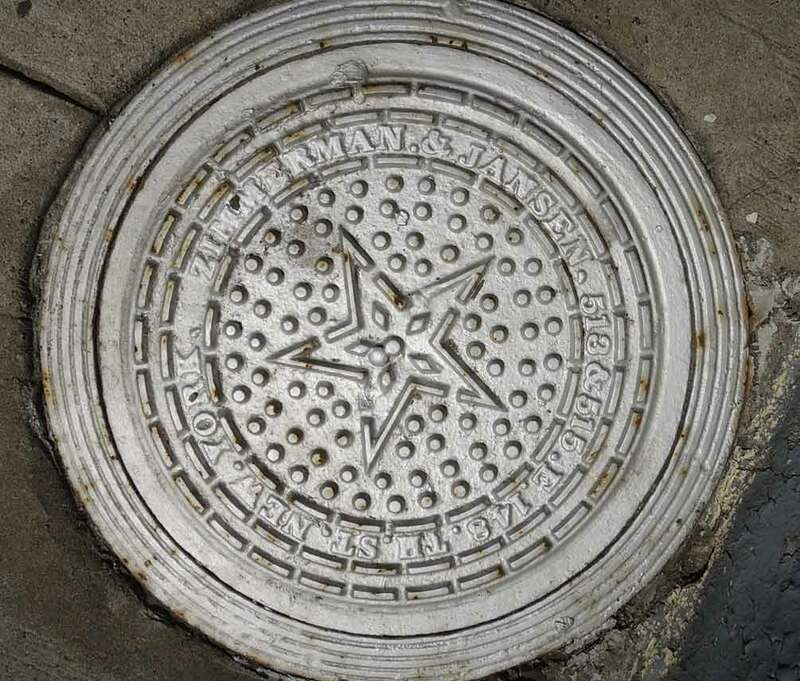 Several coal chute covers inscribed either L. J. Zimmermann or Louis J. Zimmermann survive, including those at 453 W. 140th St., at 463 W. 140th St., and at 474 W. 141st St. One notices that these later products spell Zimmermann with 2 Ns, while there was only one N in Zimmerman & Jansen. Directory listings from the time go back and forth with the two spellings. Another Zimmermann & Jansen cover, located at 549 W. 152nd St., spells Zimmermann with 2 Ns.